The Grand InterContinental Seoul's Japanese restaurant, Hakone, will be reopening on Sept. 14, 2006. An exotic Zen-style entrance has been added as well as two private rooms in the teppanyaki zone. To celebrate the reopening, Hakone is offering three new sumptuous set menus. 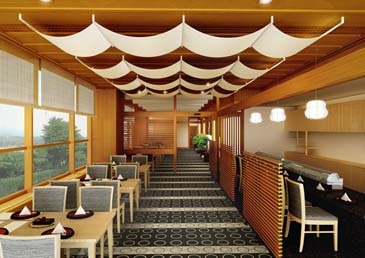 Moreover, Hakone's patrons can enter to win many valuable gifts such as room certificates until Oct. 31, 2006. The new set menus that will be available for one month starting from September 14 include seven and eight course menus. The "Yorokobi Course" starts with a dish made with asparagus, freshwater eel jus, and wasabi. This is followed by shrimp roll clear soup, assorted seasonal sashimi like fresh horse mackerel, and grilled Wagyu beef and rare pine mushrooms harmonized with wine teriyaki sauce to name a but a few of the tempting dishes. The "Shiosai Course" set menu comes with teriyaki monk fish liver, crunchy roasted almonds with ginger, and steamed rolled sea eels with mountain yam and gingko nuts, followed by other dishes. Lastly, the third set menu consists of clear soup with beef rib eye and mushroom rolls, tuna tataki with ponzu sauce, teriyaki Wagyu steak with vegetables, and cold shabu shabu with savory sesame sauce. All of the set menus include sweet and refreshing desserts. As a result of this renovation, Hakone now has a total of 10 private rooms as well as new carpets in sophisticated monotone colors that help to create a luxurious and soothing atmosphere. In addition, there are new dividers behind the chairs of the sushi bar that will maximize our customers' privacy. The prices of the reopening celebration set menus range from 110,000 to 130,000 won excluding tax and service fee. Please keep in mind that Hakone's premium dishes and set menus, aside from these three promotional set menus, are still available. 02-559-7623.